The antics of these little birds are fun to watch. Black-capped chickadees seem so unafraid of humans that they almost seem tame. One can walk right up to the feeder and they will still fly back and forth to it as if you are their best friend. I have come to believe that is because they are exceptionally smart creatures and realize that you ARE their best friend since you are feeding them! One year, something happened that brought this home. It was a very busy time for me that winter. More than once, I let the feeders go empty without noticing. 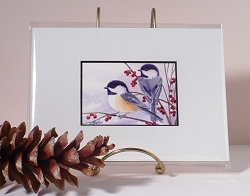 One day while at my easel, a chickadee came to the window and started tap-tapping on it. He'd fly away and then come back and tap again. I got up to see what was going on. Sure enough, the feeder was empty! Now, these birds don't generally tap on the window, so I'm thinking he knew I was there and wanted some attention for the empty feeder situation. He somehow knew, even though I never go inside through the window, that he could tap there and I'd come out. After filling the feeder, he did not come back to tap until the next time it was empty! What do you think? Do wild birds communicate with us? Do you have a story? This painting has been sold. 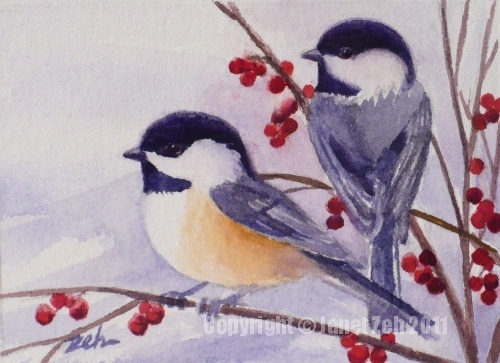 But you can get other of my bird paintings in my Etsy shop at JanetZeh.Etsy.com.